Sagittarius December 2019 horoscope foretells that after the 23rd of November family matters and emotional security will take over career development and financial success in your life. This shift is because the planets are more aligned to the Southern part of the horoscope. Sagittarius sun sign will put more emphasis on personal enjoyment this month. There will great progress in family interactions even though there may be some difficulties and obstructions here and there. As per the December horoscope 2019, your love life is a hundred percent active this month without any silly disagreements coming up now and then. Romantic opportunities are chasing after you, and you have no intention of letting them go. The Sagittarius horoscope 2019 predicts that there may be arguments in your family between family members. But, as the month progresses peace and harmony will start being felt. The Sagittarius children will exercise a tremendous amount of discipline and motivation at school. According to the horoscope 2019, your health will be superb this month, but you will need to take good care of yourself for the same to happen. Learn how to take lots of water while at the same time consuming different kinds of fruits. This will boost your energy levels and provide your body with the necessary nutrients. The December Sagittarius horoscope 2019 says this month your focus will be mostly on family affairs. But, you will also be thinking about your career and how to better yourself to achieve a higher rank in the workplace. Promotions may come easily to you since you are hardworking and committed to all your duties and responsibilities at the workplace. Monthly 2019 astrology foretells that finances will not be a problem for you because you are determined and motivated to achieve greatness. 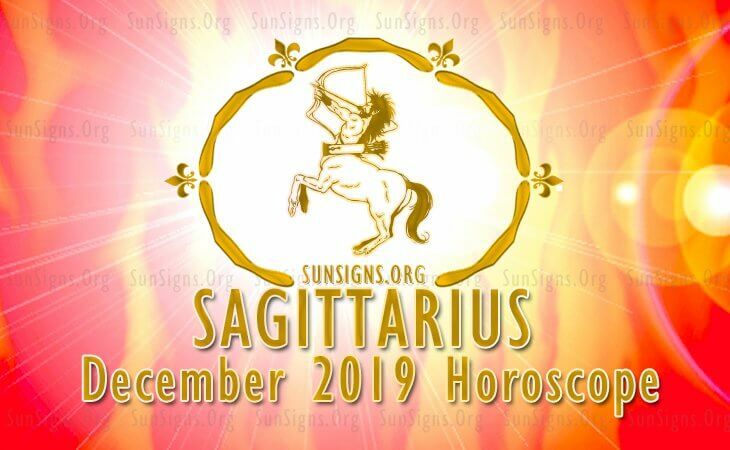 Sagittarius horoscope 2019 predictions show that education for you in December 2019 will be good since all your goals and objectives will be achievable. Those pursuing education abroad will get the right opportunities, and they will prosper immensely. As per the Sagittarius December 2019 horoscope, you will travel a lot with your family. Hence, you will visit new places, and exotic destinations with your loved ones. You can refer to Numerology 2019 horoscope.